I had the most wonderful interaction today and I have to tell you about it. I serve in the children’s ministry at church, what we call the Primary, where we work with children from 18 months old through their 12th birthday. Each Sunday I get to see about 60 smiling faces, and together we sing, we talk about Jesus, we have fun lessons, and as leaders and teachers we try to make sure that each individual child feels loved, both by her teachers and by her Savior. 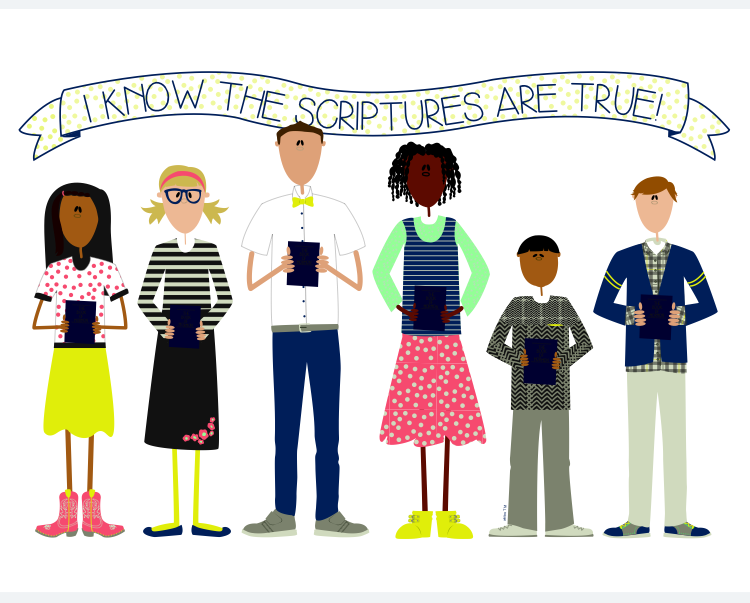 Every year the worldwide Primary has a theme, and for next year, 2016, the theme is “I Know the Scriptures are True.” Perfect. I happen to also be part of a Facebook group of women around the world who also work in the Primary organization. We are all volunteers, and many of us are new in this kind of work. We need each other. In this group these faithful women share inspiration and ideas on teaching our children, things that have worked or maybe not worked so well, and lovely things they find to make Primary a beautiful and good experience for the children under their influence. I loved it. This is so my style. I mean, I’m not graphically talented and could not create something so wonderful, but I can definitely appreciate it. I thought my Pioneer Girl would love it too. I could see it framed and set on her picture shelves in her room, among the family history photos she loves to display there. The only thing was, I wanted her represented there. I wanted a face with a little darker complexion, maybe some curly hair. So, seeing this art and recognizing the kind heart of the person who created it, I emailed the artist and asked if she might be willing to make a little tweak, if she might see one or two of the children in that picture as kids of color. And she did! She responded immediately, even asked for a photo of our Pioneer Girl to model her character after, and set to work. The multicultural version is now for sale in her shop — and before I could even order it, she gifted me a printable file. So of course now I want to tell everyone about a kind heart in Utah, a talented artist and some lovely work that might brighten your day. Go shop Whit Ro & Co and see if there’s a cute image you want to print out and snail mail to a friend. Thank you, Whitney!